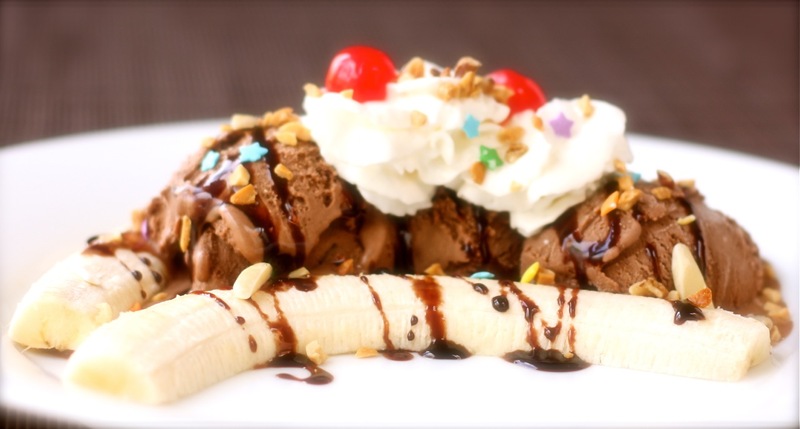 The Banana Split is a classic ice cream dessert and one of the most popular in the United States. Traditionally, it consists of three scoops of ice cream, each with its own toppings – vanilla ice cream with crushed pineapple, chocolate ice cream with hot fudge sauce or chocolate syrup, and strawberry ice cream with strawberry sauce – on top of a banana sliced in half lengthwise. The whole concoction is further topped with marshmallows, whipped cream, nuts, and maraschino cherries. This dessert is definitely over-the-top! My version of the banana split is much simpler, and yet, still decadent. The banana is topped with three scoops of homemade Chocolate Peanut Butter Ice Cream and drizzled with chocolate syrup, whipped cream, nuts, sprinkles, and, of course, maraschino cherries! We all love the combination of chocolate and peanut butter. This ice cream recipe blends both flavors perfectly. Each one stands out, but in combination, it is pure bliss. It is rich, creamy, and smooth. When served in a banana split, the banana gives it another dimension and you’ve got the perfect trifecta of flavors! Arrange the banana slices on the serving dish. Place three scoops of ice cream on top. Drizzle with chocolate syrup. Add a couple of dollops of whipped cream. Top with sprinkles, chopped nuts, and maraschino cherries. Enjoy!! Melt the semi-sweet chocolate in a heatproof bowl over simmering water, stirring occasionally. When melted, gradually whisk in cocoa. The mixture may clump together at first, but slowly pour in milk and continue to whisk until it becomes smooth and the cocoa is incorporated. Remove from heat and cool for several minutes. Set aside. In another heatproof bowl, whisk eggs until light and fluffy, 1-2 minutes. Slowly add sugar, whisking constantly until the sugar is thoroughly combined, about one minute. Add heavy cream and vanilla extract and whisk to combine. Place the bowl over the simmering water and cook over low heat until the custard reaches a temperature of 170 degrees and coats back of spoon. Slowly pour cooled chocolate mixture into custard, whisking constantly. Transfer to an airtight container, cover and refrigerate overnight. Remove 1 cup of ice cream mixture into separate bowl. Add the peanut butter and whisk until smooth. Add this peanut butter mixture back into the rest of the custard base. Pour the cold custard into the ice cream maker and churn according to the manufacturer’s instructions. Transfer the ice cream into a freezer-safe container and cover tightly. Ice cream adapted from this recipe from Scrumptious and Sumptuous. I’ll just be skipping the fruit, liking neither bananas nor maraschino cherries. I’m sure I’d like the ice cream though. Mmmm, banana split with peanut butter.. Sounds heavenly! And the ice cream is homemade – score! Thank you, Daisy!